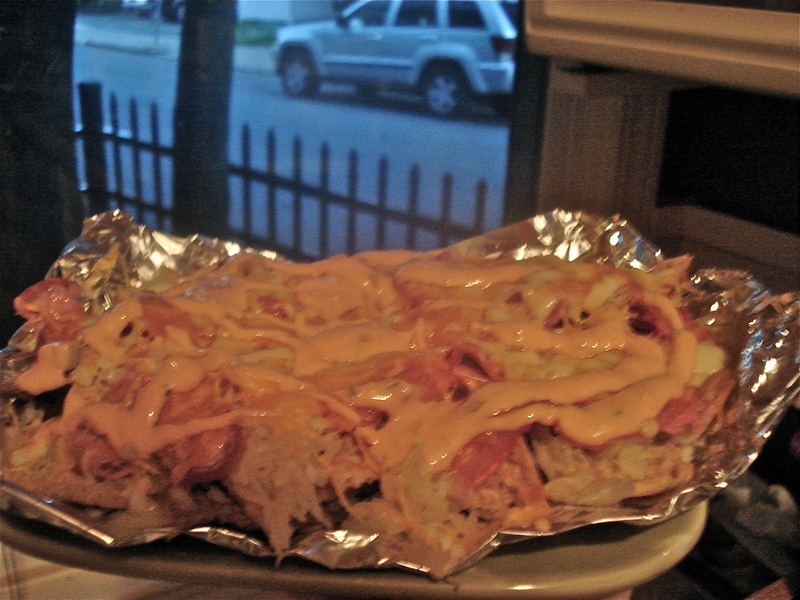 We have much love for the Reuben sandwich and have been curious about Reuben nachos for some time; yet an extensive (2-minute) Google search revealed that only one restaurant in the US makes them, the Loco Leprechaun of Cleveland, OH. Not having any travel plans in the area in the near future, and at the behest of our loyal readers, we decided to take matters into our own hands and create our first Nacho Patrol Original Specialty Nachos. 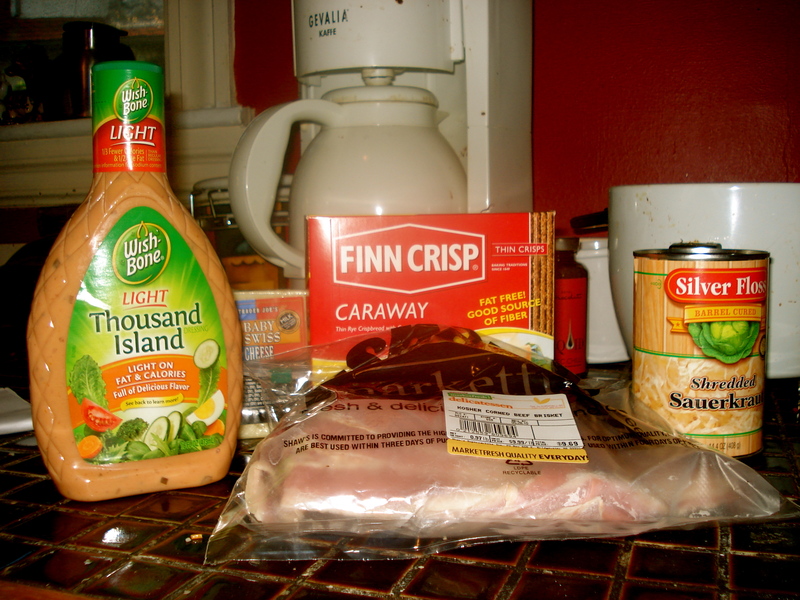 Fortunately for us, most of the ingredients you would use to make a traditional Reuben sandwich translate directly to nacho toppings: Swiss cheese, sauerkraut, corned beef and Russian (or thousand Island) dressing. 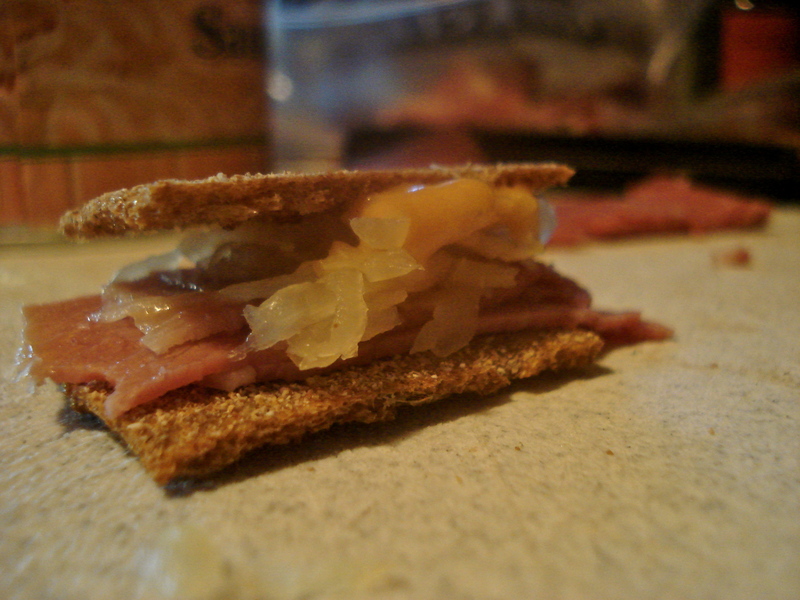 The one point of uncertainty was the chips: no standard tortilla chips would do, as rye bread adds a distinct and crucial flavor to the sandwich as a whole. After scouring the supermarket cracker aisle, a suitable substitution was found: caraway rye crispbread. Much thinner than Ry-Krisp and not as dry, these looked like the optimal choice. We also invested in some plain pita chips, as backup. Verdict? While lacking in the cooler color spectrum, these were still quite appetizing to behold. Overall, they were drier than we normally like our nachos, but that was to be expected due to the ingredient list. The rye crackers did indeed add a nice flavor though got soggier than normal chips. The big ingredient disappointment was the Swiss cheese. 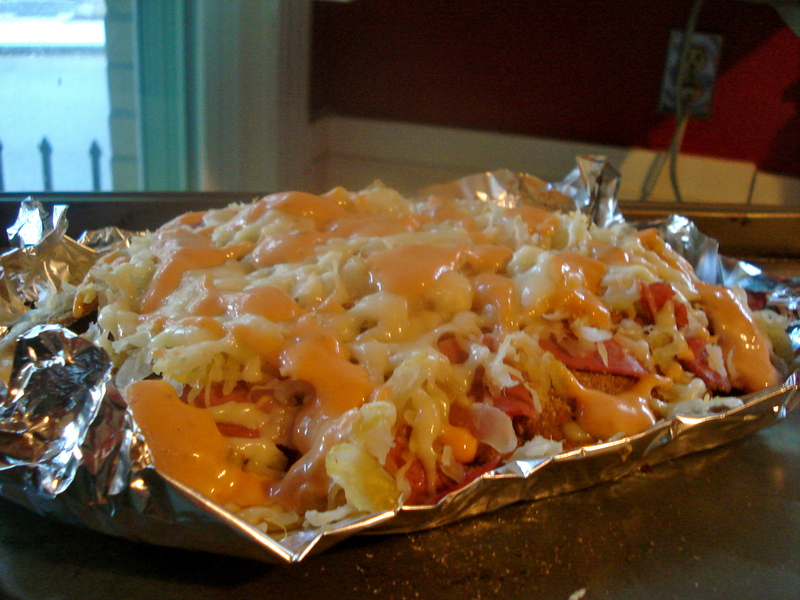 In general, Swiss just doesn’t melt as well as your standard cheddar or jack, and therefore did not do a good job of sticking to the chips or the other toppings. Hungry for a challenge (and more nachos), we tried to improve upon them with the second batch. We mixed the rye crackers with pita chips for more texture and variety, doubled all of the toppings, and combined Swiss cheese with shredded cheddar for increased gooeiness. With an extra layer of dressing in the middle, these were just what the doctor ordered (us not to eat).